Four flanger and phaser algorithms with ultra-wide frequency range (20 Hz to 10 kHz). Envelope matrix offering 10 envelope shapes; adjustable time, curve and lag. Eight parameter snapshots in each preset for real-time switching or automation. Multiple utility functions for randomizing, cloning and time-shifting sequences. – Redesigned user interface with improved contrast, new color scheme and more legible fonts. – All-new, much more efficient DSP algorithms for step sequencer, multi-envelope generator, parameter slew and modulation lag. – Added live input waveform display visually aligned with the envelope sequence. – Added 4- and 8-stage feedback phaser effect options. – Added new controls for min/max modulation range and effect output level. – Added new “triple ramp” envelope shape. – Added envelope curve control (logarithmic to linear to exponential). 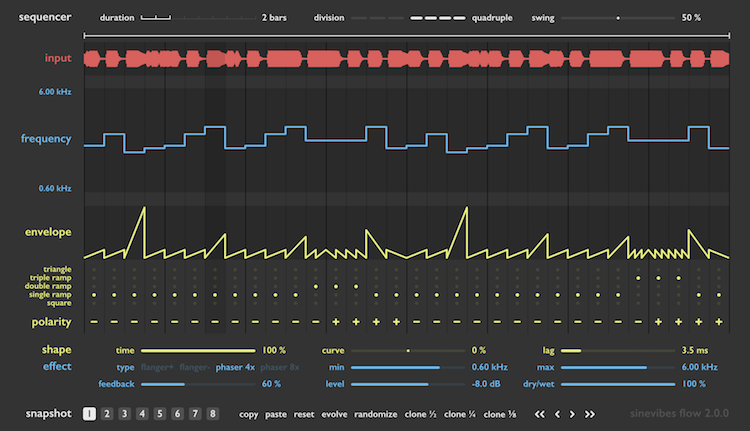 – Added utility functions to “evolve” the sequence or time-shift the sequence by +/- one step or one beat. – Added shift-click and drag to relatively adjust all steps, control-click and drag to snap steps to 10 fixed values. – Added support for mono-to-stereo channel configuration. – Waveform analysis is only performed when the user interface is open.